Here at Clear View Bag our mission is to help our customers acquire custom bags. We emphasize fast response times and quick lead times. To achieve our goal we need to operate with a high level of efficiency. In order to increase efficiency, our plant recently purchased a new state of the art printing press. The new press’ automated features and user friendly operating system have already made a large impact on our printing process in the past year since bringing our new machine in. Paper Converting Machine Company (PCMC ), which is a Barry Wehmiller company, supplied us with the new press last summer. 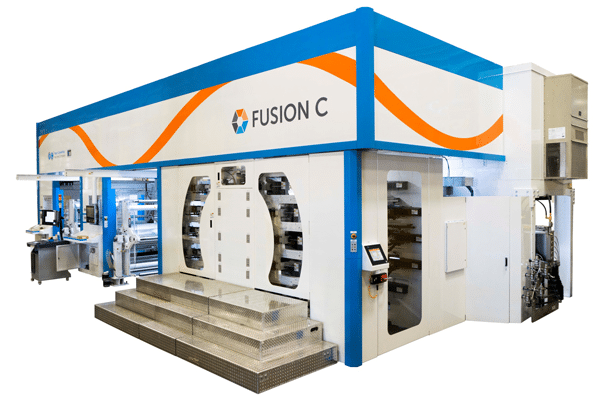 The new press is part of PCMC’s Fusion series and allows us to print up to a maximum of 8 colors per run. This unit contains the largest ink chamber opening we have and also uses no solvent during the wash-up process because the machine runs on water based inks. The wash-up process is very important in the world of printing presses. The anilox need to remain clean and clear of built up inks in order to have the cleanest and sharpest lines in a print job. The new press has a hands free, fully automated wash up process. The operator can select from an array of cleaning cycles such as a light wash, flood wash, or even a manual touch-up. All of the controls are mounted on a touch screen for a very user friendly cleaning process. The system allows for the operator to wash-up any or all of the print decks at the same time. The operator does not have to wipe down the anilox by hand which leads to a reduced level of ink contamination from potentially mixing colors throughout the cleaning process. Sharper print lines speak to the high quality and consistency that we strive to reach for our customers. One technological advancement included with the machine is the TruePrint System which was created in a collaborative effort between PCMC and AVT to aide operators in the set up process for each job. This operating system allows for the press operator to import the customers PDF file with the artwork for the job right into the press’ camera. The combination between the press and camera set the impression on press in the first stage of the process. During the second phase, having the PDF imported to the camera allows us to set register. This entire process is automated meaning there is no need for operator intervention. The computer that is powering the machine can react much quicker than a human operator to detect a problem with the print on the film. This can assure that the print on the film is exactly what the customer approved and it also drastically limits our waste output because of the increased intervention speed built into the machine. The print on the film is also cleaner on the PCMC because each print deck on our press is servo driven, meaning there are no gears on the print deck. When running screen printing on other presses it is only natural to have markings on the image known as gear chatter or gear marks. These marks are created as the press runs and the gears are meshed together. Our new machine runs smoother and has cleaner screens as a result of not using gears. TruePrint automatically sets the impressions using previous actual print settings. The system does not require the use of any film to set the print which means that a minimum amount of film is wasted in the process of setting up the job. The system allows for the print decks to be correctly calibrated over time automatically and individually. TruePrint memorizes and maintains an average of all of the printer offsets. TruePrint stores the printer offset information and then takes that stored information to provide a more consistent impression setting for job after job. One of the first and noticeable differences between the new press compared to our older units was the noise emitted by the press. The PCMC Fusion series is much quieter than the older presses we still use in our plant. With an operating noise level of <85 dBA (A-weighted decibels), the new press is much more operator friendly. The new press is also much safer for our operators to work with compared to some of the older units we use in our print shop. This is the newest design PCMC offers in their machines, giving it up to date safety standards. PCMC included OSHA standards of a zero-speed interlocked guarding system and no open flames as part of the drying process. The new press utilizes a patented drying system created by PCMC called Flextreme. The press’ drying unit runs off of heated compressed air. The air is heated using the energy built it from the compressor itself. What makes this unique is there is no need for a natural gas heater to heat the air used during the drying process. Cutting down on the burning of natural gas is good for the environment as it cuts down on the burning of fossil fuels. Cutting down on power consumption and waste is a goal at Clear View, as we strive to be as environmentally conscience as we can be throughout our printing and converting process. The PCMC press also operates using water-based inks. Water-based inks emit very low to no VOC (volatile organic compounds). VOC’s are detrimental to the environment. Water-based inks are a much better environmental choice for printing on flexible packaging. The new machine also possesses regenerative power braking capabilities meaning the press generates power while the drum inside the machine while shutting down. This regenerated power is fed back into the machine, reducing energy output and costs. The power braking can slow the machine down from 2000 fpm (600 mpm) in 15 seconds in the event of an emergency. Thank you for reading! If you liked this blog, check out our other posts and stay tuned for more information about our plant and the plastic industry as a whole!